MAX'S BIRDING DIARY: BLIMEY I FOUND A DECENT BIRD. BLIMEY I FOUND A DECENT BIRD. Yesterday morning at Brandon Marsh I found a decent bird.In fact I found two and followers of this blog know I hardly ever find anything so it was a pretty decent morning. 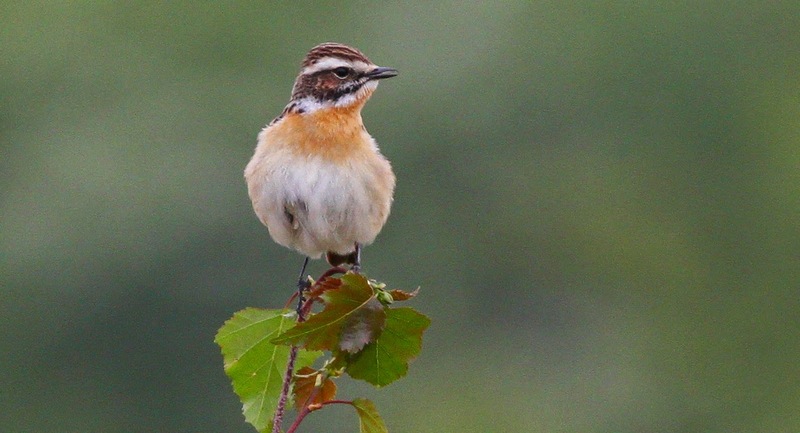 Got there at 9.30 AM and intended to walk along the path to the west of the north reed bed to try and find some Grashopper Warblers.Just as I crossed the coach park I scanned the bushes below me and soon cried out "Bloody Hell" because I'd spotted a cracking looking male Whinchat. I had to be patient and wait for the sun to come out and not get too close for fear of disturbing it.In the end I managed some decent shots.What cracking looking birds these chaps are. After leaving a note in the sightings book in reception I had a good walk round the reserve but after nearly 2 hours all I'd seen to photograph was a Chiffchaff.All the ponds were very quiet. Feeling a bit deflated after the excitement of finding the Whinchat I decided to go after the Cetti's Warbler I'd got shots of last week near the Newlands bench.I could here it calling out but it took ages before it showed very briefly and I was able to rattle off a few shots.Very pleased with the shots because not only are they a swine to get shots of but there are very few at Brandon compared with a few years ago. Not long after the Cetti's disappeared into the undergrowth I again cried out "Bloody Hell" because way off above the Newlands I spotted a Hobby.First of the year for me and one of my favourite birds.Spent an hour trying to get some decent shots but couldn't not because of the distance but because the sun was always behind it.Great to see one of these chaps again.